The new exhibition “Au fil du Siècle” at Manufacture des Gobelins is devoted to chefs d’oeuvres of the 20 th century and it is a firework of colors and political themes. 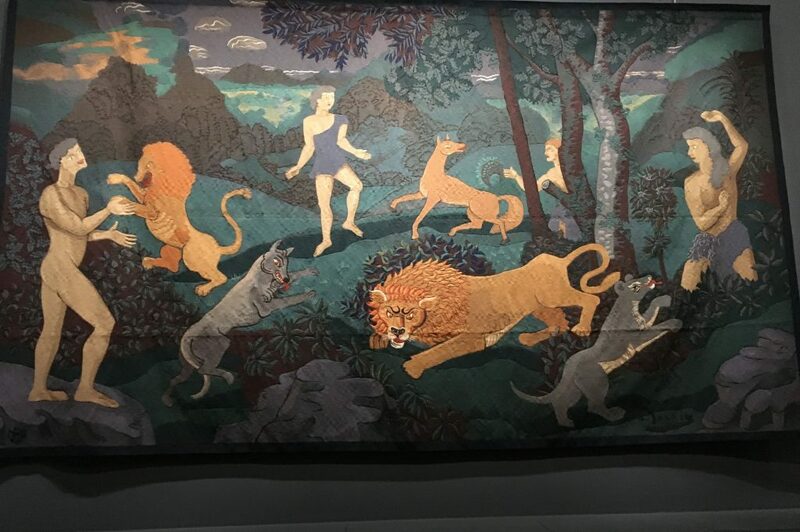 Conceived in four months and inaugurated by Brigitte Macron and Stéphane Bern, it comprises the best pieces of tapestries owned by the Mobilier National. 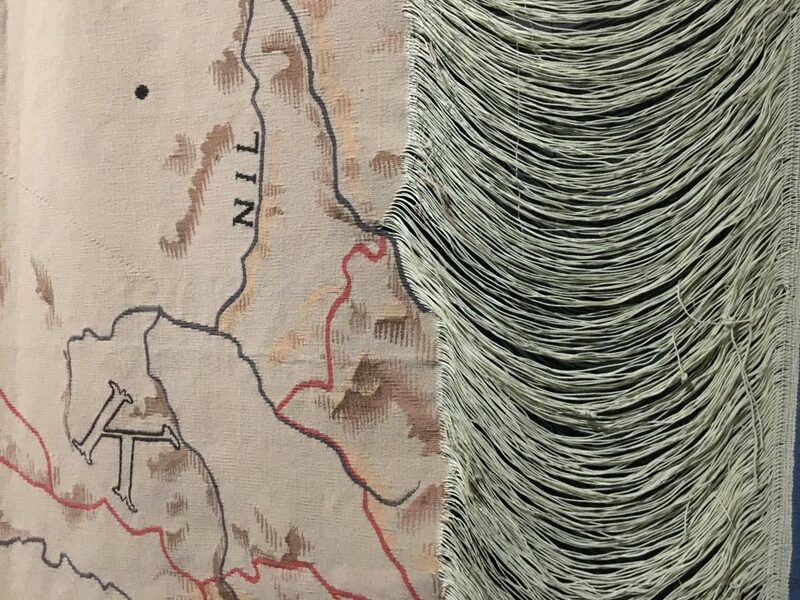 Furniture and carpets, from 1918 and the celebration of the victory, up to 2018 and the inclusion of plastic in the weaving. The mixture of nationalism and art, of modernity and color have never been so perfectly shown in wool. From José Maria Sert to Matisse and Zao Wou Ki, the exhibition shows the fascination that painters have for the art of tapestry. 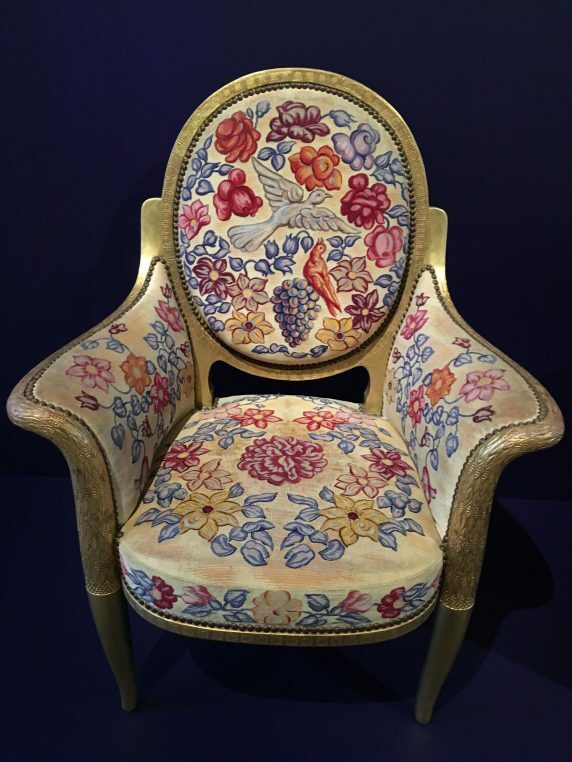 The first rooms in the show are devoted to the post war celebrations of the French provinces, and include a fabulous set of furniture “Salon de la guerre” where canons are shown with camouflage painting and surrounded by flowers. 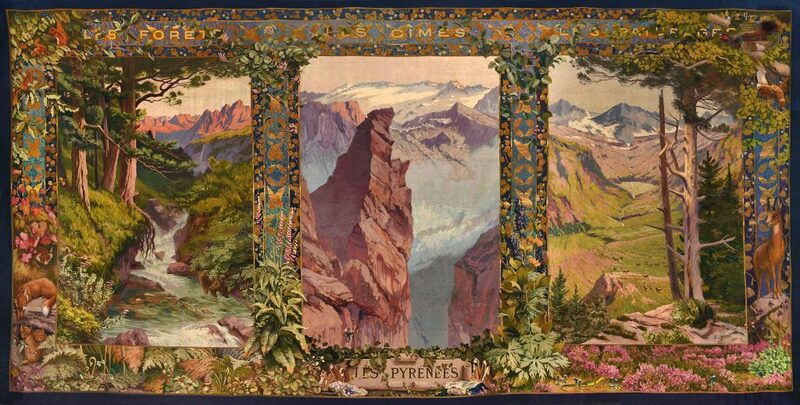 A very large triptych by Edmond Yarz celebrates the Pyrénées, one of five projects on the French provinces. The mountains on the border of Spain are depicted here with high summits, forest and wild animals. The Belle Epoque is celebrated with “La Loge” by Pierre Bracquemond, a disciple of Léon Bonnat, and later Armand Albert Rateau is represented by a very exceptional series of furniture, “Les Oiseaux d’Or” covered in tapestries by René Piot. An Art Deco carpet designed by André Auclair shows a starking contrast between flowers and fruit and a geometric center in black and blue. 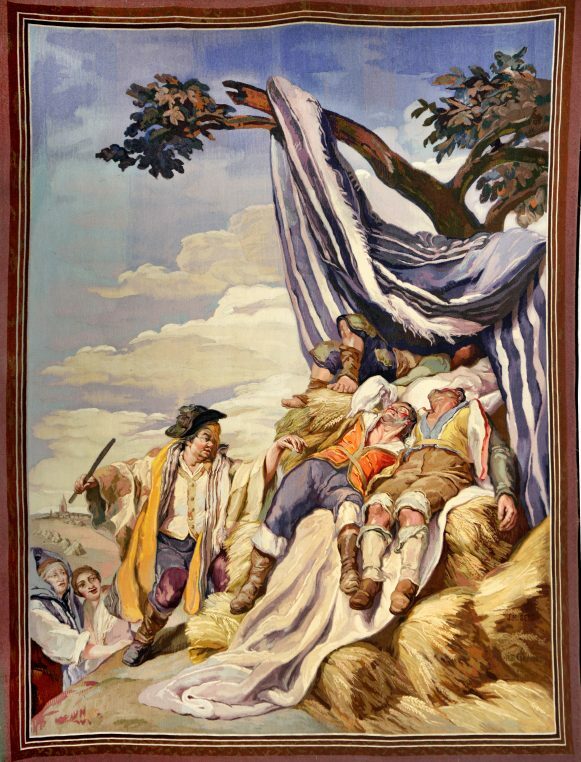 José Maria Sert is present with a country scene of sleeping peasants. Travelling is well represented with Spring in Paris, by Marcel Gromaire, Asia by Pierre Dubreuil, Alsace and Pyrénées by Lurçat. All these works show how brilliant the weavers were at reconstructing “paintings” with wool. 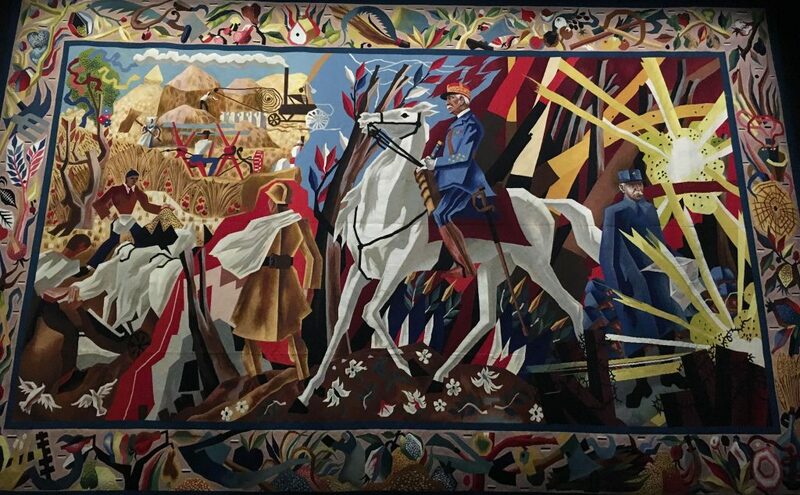 One room is most amazingly showing war time tapestries commissioned by the Germans and Maréchal Pétain. 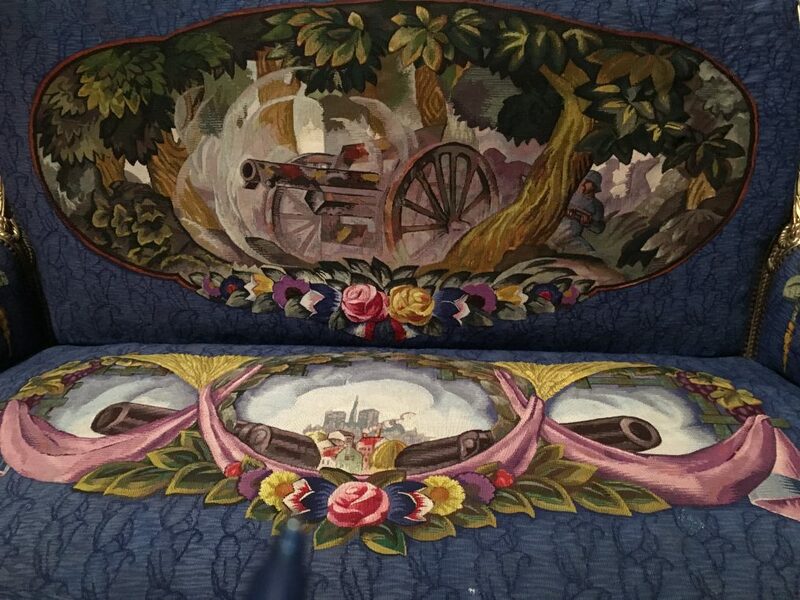 Fascinated by the know how of our manufactures, Goering asked to repatriate some of the Aubusson workers who were prisoners in Germany, and settled them near Paris in Courbevoie. They were to weave as fast as possible four large tapestries for his personal library in Carinthall and for Ribbentrop’s Ministry of foreign affairs. They are now kept at the Louvre and one of them is shown not quite finished, representing the earth with all of the German territories in Africa. It is frightening and dramatic. Werner Peiner, The Terrestrial globe, 1941-1944, detail, Manufacture des Gobelins. 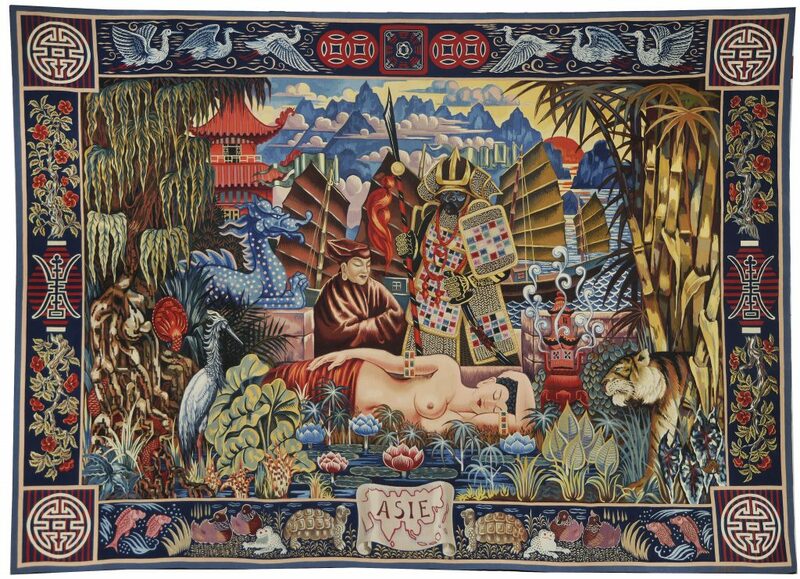 This tapestry commissioned by Goering for his library, was never achieved. The tapestry representing Pétain is especially beautiful with many symbols of agricultural wealth and tools on the frise around it. It was designed by Paul Charlemagne as one of the many propaganda artifacts for the Maréchal. The medieval technique of tapestry weaving is allied with a very modern style. 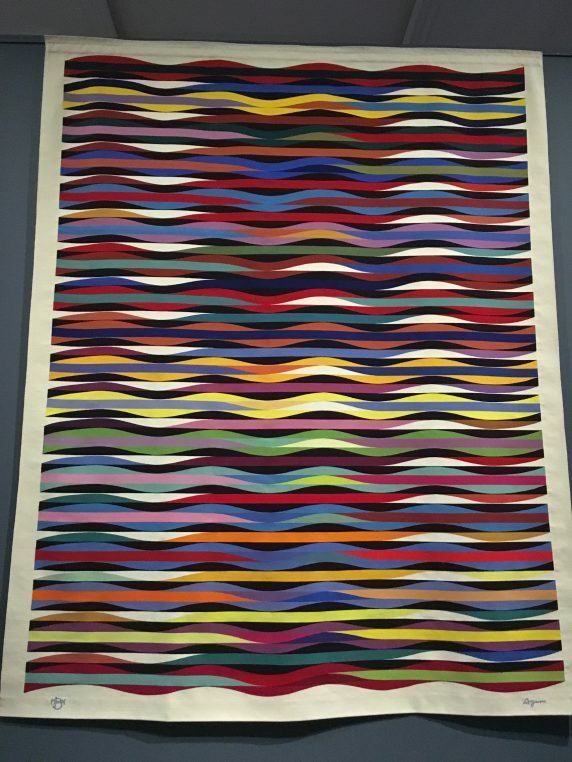 On the first floor, the last rooms of the show are devoted to the last fifty years and we have the surprise of discovering that Matisse, Picasso, Vasarely, Sonia Delaunay, Hans Hartung all created tapestries. New experimentations are made with plastic tubes woven into wool by Nicolas Schöffer and François Morellet has two beautiful abstract tapestries. Chillida and Louise Bourgeois conclude this pantheon of creativity. This exhibition is a true surprise and is not to be missed, Manufacture des Gobelins, metro Gobelins, until September 23.